The Otis Report on the Creative Economy collects data across artistic fields including arts education, entertainment, digital media, architecture, fashion, and publishing. The most recent report found that the state of California is the leading contributor to the creative economy, with an industry output of $374.5 billion annually. 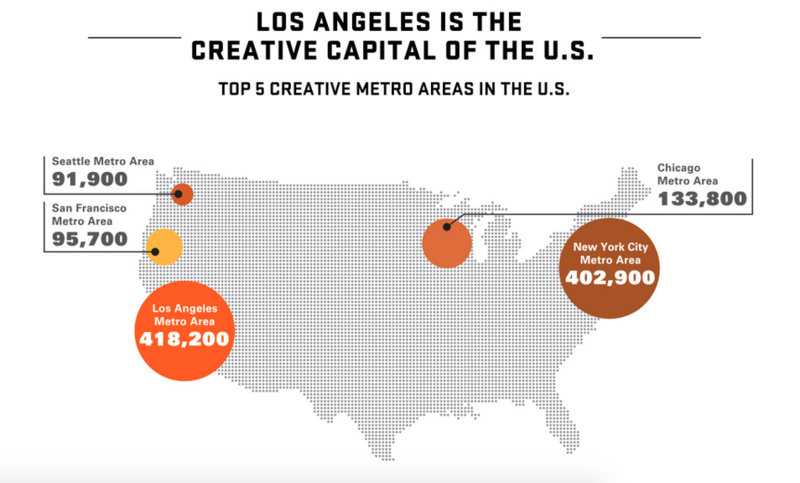 Additionally, there are about 1.6 million creative industry workers in California, making up roughly 10% of the state’s total working population, and Los Angeles remains the creative capital of the U.S. with 18% of its working population in the creative sector. Leading as one of the state’s most valuable economic assets, the creative industry is to California what the coal industry is to West Virginia. Whether one works directly in the industry, or interacts with it with some regularity, it is important to many Californians that the creative economy continues to thrive underneath the next president. Whether you’re a young graduate looking to enter the industry, or someone with an already extensive career in the arts, it is important to understand the substantial impact our next president could have on the creative economy. So which candidate will be the best arts advocate? In 1999, Clinton created the White House Sculpture Garden and received a National Arts Award for Arts Advocacy for her support of arts education. Clinton was also a member of the U.S. Senate Cultural Caucus which was formed in 2006 to protect arts education grant programs at the U.S. Department of Education. After completing her tenure as Secretary of State, in 2013 Clinton wrote an op-ed for Vanity Fair in where she discussed art as a tool of diplomacy. Based on her extensive history and continued commitment to supporting the arts, it is clear that Hillary Clinton would be an arts advocate in the White House. Bernie Sanders also has a strong record of supporting the arts. While Vermont isn’t quite at the level of California and New York in terms of its creative economy, a 2010 study found that Vermont’s art industry outputs about $443.5 million, and the arts industry was the 5th largest employer of Vermont’s working population. 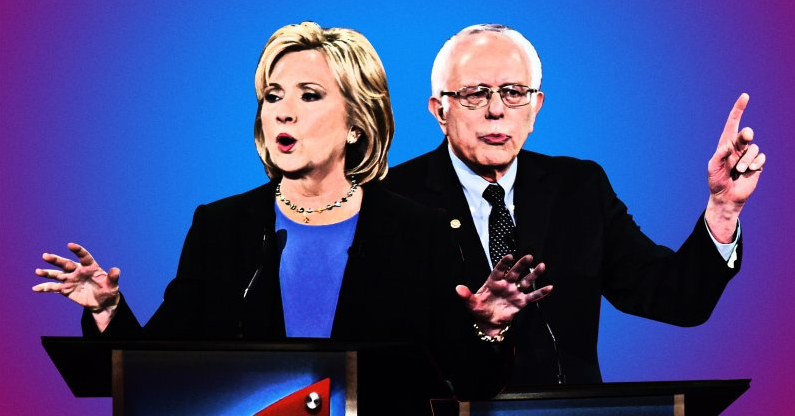 It is no surprise then, that Sanders is such a staunch advocate for the arts. Sanders continues to highlight his history of defending the arts, and concludes his video with a strong statement where he promises to promote the arts as a major part of his platform. 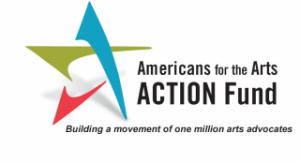 Sanders also has an excellent Senate voting record in arts advocacy, and has received an A+ on the Arts Actions Fund’s Congressional Arts Report Cards since 2004. Sanders has also been supported by a number of high-profile artists, and has been endorsed by the group Artists and Cultural Leaders for Bernie Sanders. Sanders strong history of supporting the arts, both as mayor of Burlington and Senator of Vermont, indicate that Sanders would undoubtedly be a “yuge” advocate for the arts in the White House. Donald Trump’s record on arts advocacy is far more nebulous than his opponents, due in large part to the fact that he has never held public office. In a March 2016 Washington Post interview, Trump did pay some positive lip service to the value of a well-rounded, liberal arts education. Trump has personally donated $465,125 to arts-affiliated organization in New York since 1994. However, Trump was at the center of the 1980 Bonwit Teller controversy, where his workmen jackhammered art deco limestone panels into bits despite them being promised to the Metropolitan Museum. When asked why they were destroyed, the Trump organization responded that the historic panels were “without artistic merit.” Not exactly a great example of arts advocacy. While it is still difficult to determine the extent to which Donald Trump would be an arts advocacy president, his position on the Department of Education alone would have an extremely detrimental impact on arts education and funding. The creative economy and arts education are important issues to many Californians as they have direct impacts on both our economy and our cultural footprint. Hopefully this will serve as a useful guide to voters as they cast their ballots for our next president and Arts-Advocate-in-Chief. 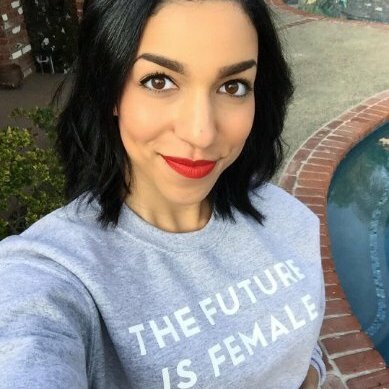 Savannah L. Barker is a recent graduate of the University of Southern California where she was an Arts & Culture editor for Neon Tommy, a digital publication sponsored by the USC Annenberg School for Communication and Journalism. Savannah is currently the Account Sales Coordinator at Center Theatre Group where she works to grow the organization’s group and corporate client base. Savannah is an arts advocate and political junkie who loves listening to podcasts, writing music, and exploring the Los Angeles arts community.